The Shrewmorgue is an unusual biological weapon existing in a perpetual cycle of growth, destruction and regrowth. The true body of the Shrewmorgue is a diminutive, insectivorous mammaloid interested in little outside food, avoiding confrontation with anything more formidable than slugs, worms and arthropods. It is during an extensive, yearly hibernation that the Shrewmorgue conceales itself deep underground, develops a womb-like cocoon of flesh and "germinates" an externalized, secondary skeletal system or "exobody" hundreds of times its original size. 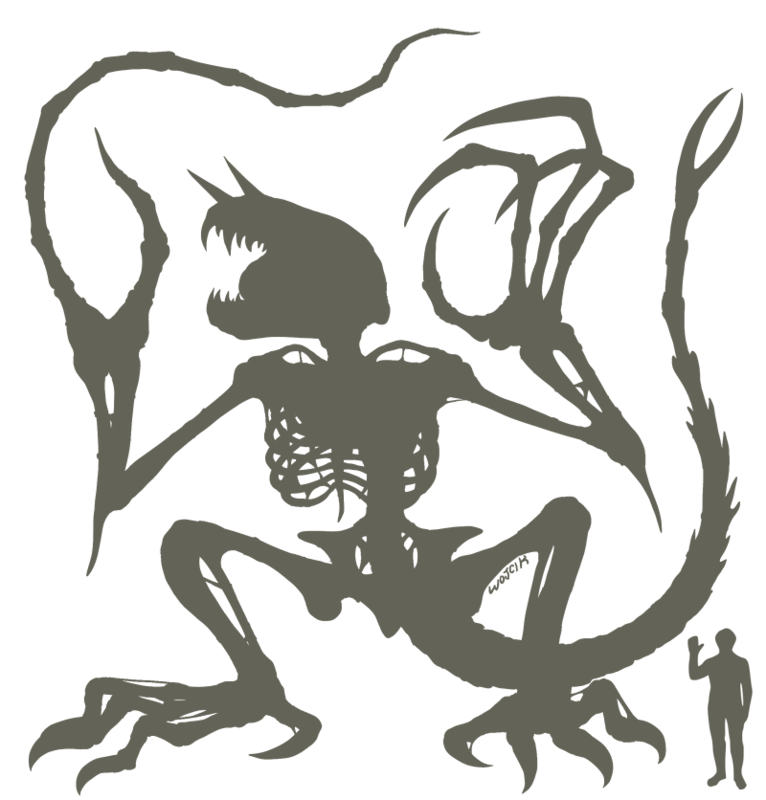 Controlled by a thin but powerful framework of both external and internal tissues, the skeletal colossus exists only to engage in a frenzy of violence until it either sustains too much damage to move or it expends the last of its energy reserves over the course of a few hours to a few days, depending on activity levels, upon which the little creature flees its collapsing exobody in terror and confusion. In its smaller state, a Shrewmorgue exists in a state of almost perpetual fear, running for cover at the first sign of danger, the first reminder that danger is a hypothetical possibility, or when it has heard more or less any distinct noise. Its sentience is minimal in this state, and it has little to no concept of its alternate life as such a formidable bioweapon. In control of its exobody, the Shrewmorgue is suddenly possessed of fierce intelligence and an insatiable lust for combat, its every victory and defeat flooding back to it with crystal clarity. It identifies only the titanic combat skeleton as its genuine "self," regarding its delicate original body as little more than an inconveniently vital organ. It remembers its activities as a frightened insect-eater only faintly, like a series of "dreams" between its many "births." With more than 99% of its mass effectively expendable, the Shrewmorgue is a fearless battler oblivious to most injury, refusing to give up a fight if it has at least two bones to scrape together. In addition to its sharp wits, agility and strength, the monster's sinews allow surprising flexibility, and it boasts an arsenal of deadly energy weapons. BONE BODY: most of the Shrewmorgue feels no pain, and only damage to its incredibly tiny core body can be lethal or completely incapacitating. 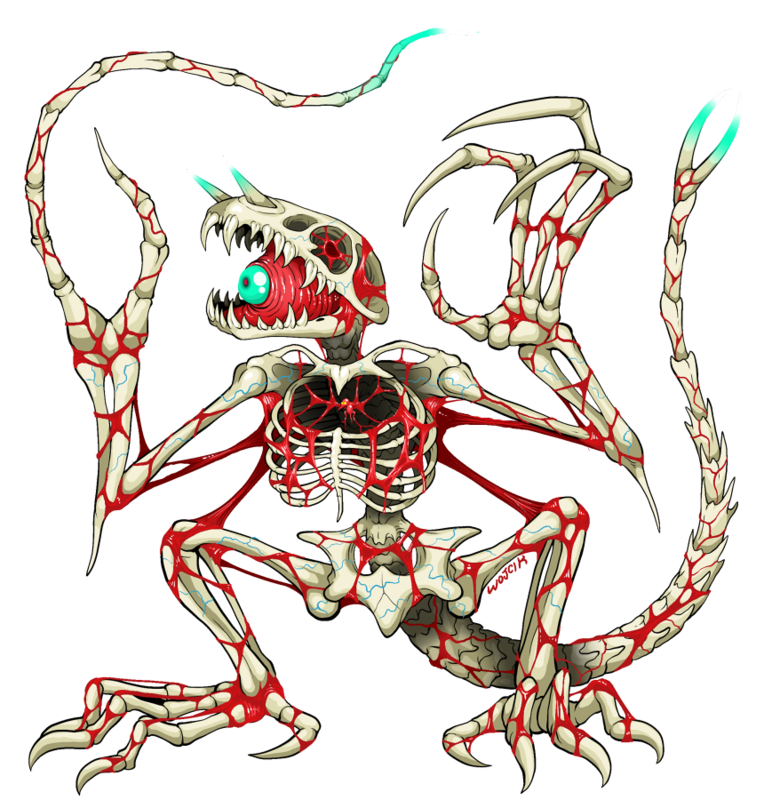 MEGABITE: with a lack of pain reception and dense internal muscle, the Shrewmorgue's skull can chomp through a steel girder. BONE WHIPS: the skeleton's tail and elongated right limb can crack like massive whips, generating a contact shockwave that can tear through a stone wall. SPRINGING SINEWS: the Shrewmorgue's web of powerful, elastic tissues allow it an impressive leap and even more impressive reach, its joints disconnecting to stretch longer distances as it swings its wicked claws. EYE SLICER: the Shrewmorgue's exobody can emit a thin, powerful cutting laser from its central eye. ELECTROSHOCK: the exobody's horns, tail and whip-talon can generate thousands of volts of electricity. SKULL BOMB: a chemical system within the monster's gigantic skull can be ignited at any time by its own laser mechanism, resulting in a massive, burning explosion and spray of razor-sharp bone shrapnel. To protect its central body, the creature will typically disconnect and hurl the entire cranium.